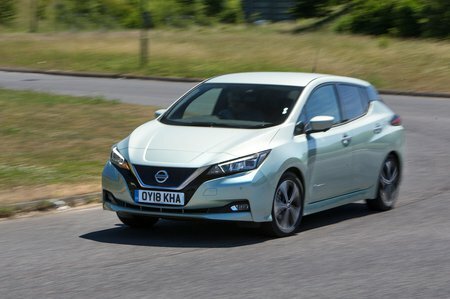 Nissan Leaf 110kW Tekna 40kWh 5dr Auto 2019 Review | What Car? What Car? will save you at least £861, but our approved dealers could save you even more. The Nissan Leaf is good to drive, well equipped and easy to live with. It's reasonably priced compared with rivals such as the Kia e-Niro, but that's largely because it has a smaller battery so can't manage nearly as many miles between charges. Range-topping Tekna is too pricey to really recommend, although that does come with full leather seats and a basic autonomous driving function that can take care of the steering in certain situations (such as motorway driving) while keeping you a set distance from the car in front. With a 0-60mph time of around eight seconds, the Nissan Leaf is nippier than a VW e-Golf if not quite as quick as a Kia e-Niro. You actually have to be a bit gentle with your right foot when accelerating out of junctions or you’ll spin up the front wheels.